URGENT – COUNCIL WANTS YOUR VIEWS – FAST! Did you see this in today’s Messenger? To give your comments go to the consultation documents. the chances of having an accident are fewer, because stopping distances are about half what they are at 50kph. Because as residents we only use the local streets for the last kilometre of a trip, and have to stop at intersections etc., the increase in time taken is a tiny proportion of the total trip (typically no more than 10 seconds, often much less). Laws need to have community support. Using the prohibition analogy, this will be seen by many as government “overreach” and will be ignored. The real speedsters don’t care what the speed limit is. 80% of crashes in Adelaide occur on the arterial roads, where the speed limit would not change. There are relatively few crashes on local streets. The savings in crash numbers are not worth the everyday inconvenience. Signs by themselves don’t do anything. If speeds are really to come down, the speed limit will need to be supported with changes in road design, which will cost millions. Having said that, Paul noted Mark’s arguments and said that he would probably support 40km/h speed limit if imposed by the State government on all local streets in the inner suburbs. The meeting also discussed the current process that the council is undertaking to gauge the public’s opinion. whether some suburbs would have 40km/h if residents there strongly favoured this, even if residents of the Council area as a whole didn’t. whether the map provided in the ballot papers included Osmond Terrace as one that would go to 40km/h or not. There was some criticism of Council’s approach in not providing the arguments as to why we should go to 40km/h, or stay at 50km/h. It should have done the research and provided the resultant information to residents and businesses before spending $65,000 on the consultation exercise. … MORE PEOPLE WALKING ??? … REDUCED CAR PARKING ??? 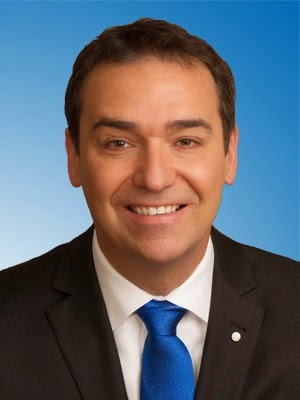 Wednesday, Sep. 30 at 7.30 p.m.
Steven Marshall, MP, Leader of the Opposition, will talk about his role as our local Member of Parliament. This will be followed by an informal Q and A. This meeting will also be our AGM and it is important all members attend. This talk will unravel the secrets behind the construction of this unique war memorial designed by the Headmaster of the Norwood Public School and built by the children themselves. It is important to note, that at the time the obelisk was constructed Commonwealth legislation proscribed that all funds that may have gone to the construction of public memorials be directed to the war effort. This legislative response in 1916 was not only economic in its intention but also political as the government set about trying to control and manipulate public sentiment following the disastrous events at Gallipoli and the high rate of Australian casualties on the Western Front. The enormous loss of life in the Battle of the Somme led to a decline in enlistments in Australia and to an outcry against the introduction of compulsory conscription. It is against this backdrop that Denise Schumann will explain the motives and the inspiration that led the Norwood school community to erect a war memorial regardless of government regulations. All are welcome to attend what promises to be a great evening of local history. 29 April 2015, 7.30 p.m. This beautiful exhibition takes the visitor from the home-front to the battlegrounds of Gallipoli and Europe where ordinary lives were changed forever by the impact of the Great War. See how a simple faded photo, a wedding dress, a bugle, a blood stained casualty stretcher and a pair of boots tell the story of courage and love, of separation and fear, and evoke memories of a time when loyalty to ‘King and Country’ was tested. 101 Payneham Road, St Peters. 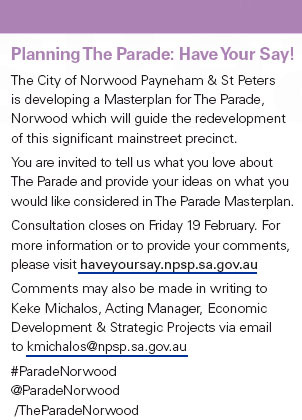 What do the State Government and Norwood, Payneham and St Peters Council plan for Beulah Road? What will it mean for residents? For cyclists? For motorists? The Council’s bike plan calls for Beulah Road to be a “bicycle boulevard”. What is a bicycle boulevard anyway? Colin Maher, Senior Planner, Cycling and Walking Section, Department of Planning, Transport and Infrastructure. When: Wednesday, 21 January 2015, 7.30 p.m.